We’d love your help. Let us know what’s wrong with this preview of One Dog Too Many by Lia Farrell. To ask other readers questions about One Dog Too Many, please sign up. What a great book! It took me a few chapters to get used to the multiple point of view with Mae December as clearly the "main character" but I ended up liking the approach to telling the story. The murder mystery was introduced quickly and the cast of suspects were clearly outlined within the first third of the book. I loved the details about dogs and the back story for several characters. I will continue reading the series! Don't remember when I read this but Ido remember reading esp. since I don't read much anymore but audiobook (avails one to be "hands-free") a requirement in my life. An enjoyable romp and main character didn't make me shout,"You just found that out 2 pages ago!" Recommended. Even if the reader wasn’t aware when they picked this up that is was set in the South, as soon as they start to meet and get to know the characters it would become apparent. The women and their mannerisms all reminded me of the Southern women I have encountered since coming to live in the US, and some even resembled family members which made me smile. Through What a great start to a series. This Author’s debut novel contains exactly all the right ingredients needed to make a perfect cozy mystery. 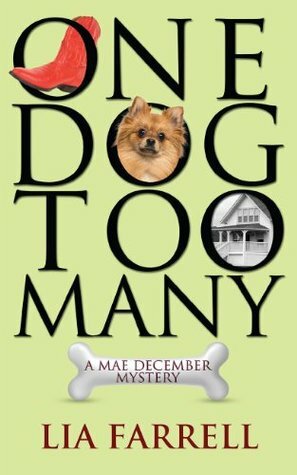 In her novel, ONE DOG TOO MANY: A Mae December Mystery, debut novelist Lia Farrell (a pen-name for a mother/daughter writing team) delivers a lively tale with plenty of twists, turns, and unexpected situations to satisfy the most ardent cozy mystery lover. The story is told in several voices, including Mae, Sheriff Ben, and Detective Wayne with Mae’s best friend Tammy piping in occasionally, giving the tale several viewpoints of the mystery. Farrell’s additional cast of characters are fun folks In her novel, ONE DOG TOO MANY: A Mae December Mystery, debut novelist Lia Farrell (a pen-name for a mother/daughter writing team) delivers a lively tale with plenty of twists, turns, and unexpected situations to satisfy the most ardent cozy mystery lover. The story is told in several voices, including Mae, Sheriff Ben, and Detective Wayne with Mae’s best friend Tammy piping in occasionally, giving the tale several viewpoints of the mystery. Farrell’s additional cast of characters are fun folks to get to know and the setting of the Tennessee countryside is charming. Animal lovers will enjoy the interaction with Mae’s kennel customers, and fans of who-dun-it’s will love figuring out the intriguing plot as the story moves along. This is a thoroughly delightful story. Considering the title, it came as no surprise this book was full of twists and laughter. I enjoyed the characters and their relationships, some simple and straightforward others more complicated and heartbreaking. The story and clues kept me guessing right till the end. This book will satisfy anyone looking for a light hearted mystery. I finished One Dog Too Many. Characters spring to life. This is a story about southern women with all the attending mannerisms, gossip and feelings the mother/daughter team were able to toss in the mix. The story was a fun, great read. The authors led up to the climax with skill, creating a page turner. Looking forward to the next one, which I understand includes the characters I liked. I enjoyed it - it was fast paced and absorbing, a puzzle within a puzzle, with many hints that I'm curious how they will be resolved. The book is good, light and an easy read. The characters could have been developed a bit more, but the authors manage to do that in the next book. Altogether it’s a pleasant read. I really wanted to like this book but I couldn't. I couldn't like Mae December, no matter how hard I tried. Call me a dog snob, but having her "rescue" two dogs only to turn around and start breeding them? Not cool. Most rescues are firm on their spay/neuter policy, so this irked me. Then Mae's change from mourning her past fiancée to being in love with the Sheriff? It was too much of an about-turn. I couldn't get into the story, possibly because of the inconsistencies. Sorry - this one just did I really wanted to like this book but I couldn't. I couldn't like Mae December, no matter how hard I tried. Call me a dog snob, but having her "rescue" two dogs only to turn around and start breeding them? Not cool. Most rescues are firm on their spay/neuter policy, so this irked me. Then Mae's change from mourning her past fiancée to being in love with the Sheriff? It was too much of an about-turn. I couldn't get into the story, possibly because of the inconsistencies. This was an enjoyable book, a mystery with almost too many suspects, and a believable plot. But something just wasn't quite there. From what I've been able to tell this is a debut novel and it holds a lot of promise. I'd read another in the series, but there were some elements of the mystery solving that simply did not ring true, and they were enough to really bother me. Not sure that I'm crazy about Mae December, but I could be. Time will tell. I enjoyed this book immensely. It had romance, intrigue, police procedures including a forensic aspect, a small town atmosphere and most importantly, dogs. I did not figure out the bad guy until close to the end. I look forward to reading the other books in the series. DNF.....two .... well more like 1-1/2 dimensional characters. It was just a slog to get through the first 50 pages and with so many good books to read I just couldn't spend the time on one that was just pretty badly written. Good start t o this series.